Healthcare Intelligence Network - Chart of the Week: How Often Are Chronic Care Patients Seen? Note: Survey participants who responded "other," predominantly indicated that patients were seen on an as-needed basis. 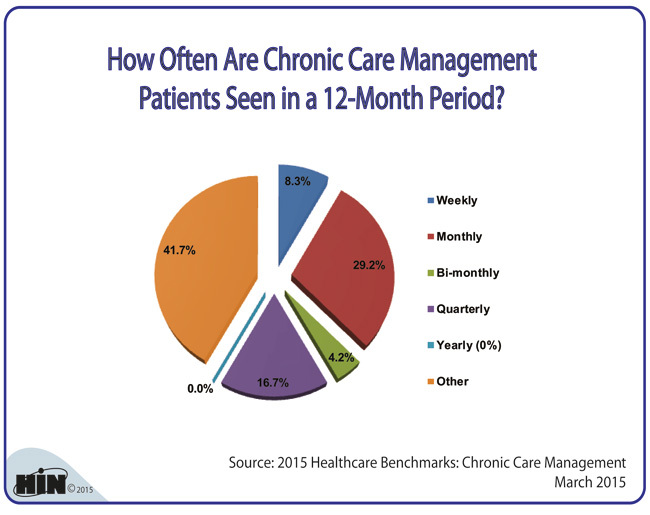 Source: 2015 Healthcare Benchmarks: Chronic Care Management, March 2015. 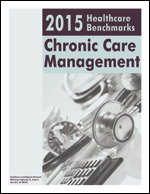 To get instant access to dozens of graphs and tables on emerging trends in chronic care management and a comprehensive set of best practices and benchmarks on care coordination for individuals with complex health conditions, download a PDF version of 2015 Healthcare Benchmarks: Chronic Care Management, today for $117. 2015 Healthcare Benchmarks: Chronic Care Management assembles a wealth of metrics on chronic care management eligibility requirements, reimbursement trends, promising protocols, challenges and ROI. Download a PDF today for just $117 in our Online Bookstore or by calling toll-free (888) 446-3530. When Arcturus Health Care did the math, CMS’s CCM code added up to a potential $100,000 per month in revenue for its four physician practices. Arcturus's Clinical Quality Assurance Manager Debra Burbary, outlines development of the patient care plan and establishment of patient goals—two CCM requirements facilitated by Arcturus's EHR. Health Risk Stratification Model: How Well Do You Manage ‘Falling Risk’ Populations?